he fall of 2007 provided the most beautiful color change in Central Oregon in my 40 years here. 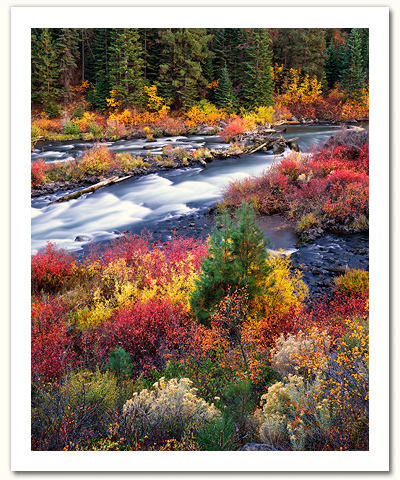 'Flowing through Fall' evolved through two successive evenings along the Deschutes River Trail. I photographed down along the shore earlier the first evening, then found this scene, too late to photograph in the fading light. Let the waiting game begin. Periodically throughout the next day my attention drifted to the river trail and the stunning scene I witnessed the night before. I became very excited, but also nervous that the weather might not hold long enough for me to realize my dream. Would the wind and/or rain take down the leaves before my return? With great anticipation I returned late the second afternoon, waited for the sun to set behind the hills to the west and began composing. Wind is always a concern with the long exposure times often required with my 4x5 view camera. However, this night would be very different. As I set up my camera I was in awe of the scene, and was breathless at how still the air had become. For thirty plus minutes the fiery vegetation did not move a muscle. I photographed the scene in both horizontal and vertical formats with two different lenses looking to the find the perfect combination. Success! In photography, timing is everything. 'Flowing through Fall' to me is the perfect combination of being in the right place at the right time, engaged in just the right activity. In the case of 'Flowing through Fall,' it took forty years for all the elements to come into alignment. For me, well worth the wait!